WWE 2K17 is a curious beast. I used to love wrestling, but I can’t exactly say I’m a fan now. Stone Cold, The Rock, Chris Jericho, Kurt Angle and so many more were part of my life growing up. The “please, don’t try this at home” warnings were consistently ignored. I loved the theatrics, but around 2005 I stopped watching. A little over a decade later I’ve seen a little and the production is arguably the best it’s been in a long time. Even during the period of not watching wrestling, the games were a part of my life. The Smackdown vs Raw series was, for me, the best sports games around. Particularly when you got to actually control a brand, or at least follow a story of your own. Wandering around the arenas, making your own path to the top, it always kept me engrossed. However, as the television production changed over time, the game has almost mimicked it. Much like the in-ring production, WWE 2K17 has improved on a number of things. However, it still has some issues that will only be fixed by a near complete overhaul. It’s perfectly understandable that the brand split isn’t an aspect of this release. The game’s development would have likely reached a level where the developers would have had problems integrating it into the game. 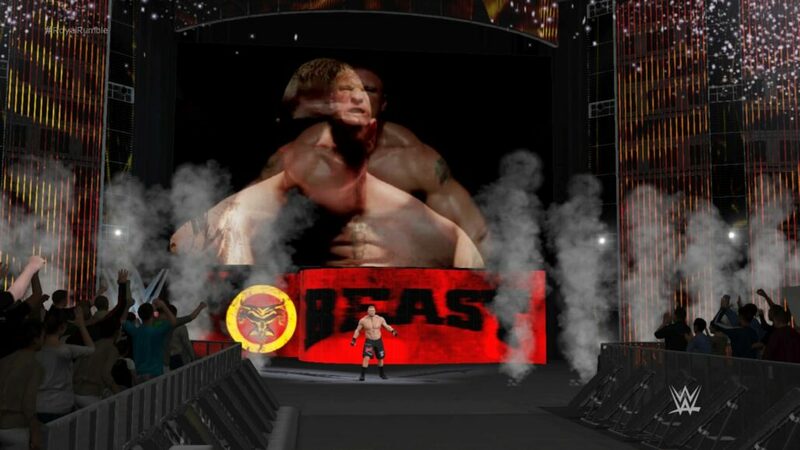 In addition to this, the 2K Showcase mode has disappeared, so the story of Brock Lesnar won’t be told like those of the previous stars that covered the WWE 2K games. The explanation is through the lack of his previous rivals not being in WWE 2K17. I can’t particularly say I agree with this if it turns out that most of them eventually feature in the game, held back through the series’ prohibitive DLC practices. Thankfully it isn’t a story of content simply being cut. The space left by Showcase has been filled by features in almost every other mode found within the game. Possibly the most notable addition has come to MyCareer mode, this being the ability to cut your own promos. It makes a great deal of sense that this has been added as one measure of a wrestler comes from their ability to connect to the fans. Look at The Rock, Stone Cold, Y2J, John Cena and Bray Wyatt with their fantastic mic skills. The big problem here is that adding more to MyCareer inadvertently further exposes what is one of the most boring and frustrating areas of WWE 2K17. I doubt it’s intentional, but the loading is the closest equivalent to the third hour of Raw you’ll ever find. I genuinely struggle to play that mode due to the sheer time spent doing literally nothing. Smackdown, Raw, Main Event and then the PPV, loading times before, during and after. It’s absolutely insufferable that this much time is spent looking at a loading screen and something that’s undisputedly getting worse with each iteration. What also doesn’t help matters is that in addition to the tedium of loading, you also get the monotony of barely seeing any logical progression. It’s bewildering to me that you can keep winning, keep getting the fans on your side and push all the limits but for months on end you’re stuck in the same dreary, drudging and pointless feuds against nobodies. Even if you take the few opportunities to try to start feuds by cutting promos against a hand-picked star, which you only get to do in the rare occasion the game hasn’t got you feuding with somebody, there’s no guarantees the game won’t simply say “Nuh-uh” and have you do the same things you’ve been doing for hours. It’s a crying shame that the collapse of the brand split led to a loss of a general manager mode. The closest we’ve got is the Universe mode, where you can book stars you want to see. Maybe you want to book the One Man Band as the top of the company. Beating Lesnar at Summerslam, pulling off a surprise at the Royal Rumble to then capture the gold. These are the stories you can create. It’s a shame then that the aforementioned DLC practices mean that some of the biggest names in the company, like Shinsuke Nakamura and the future woman’s champion Nia Jax, are locked away. I could fully understand Stone Cold, HBK or The Rock as DLC, but current active members of the roster? Unfathomable. The biggest advancements in WWE 2K17 have really come with the creation of your own star. The options available are immense in their depth, with much more available in the creation of your own entrance and the video that comes with it. 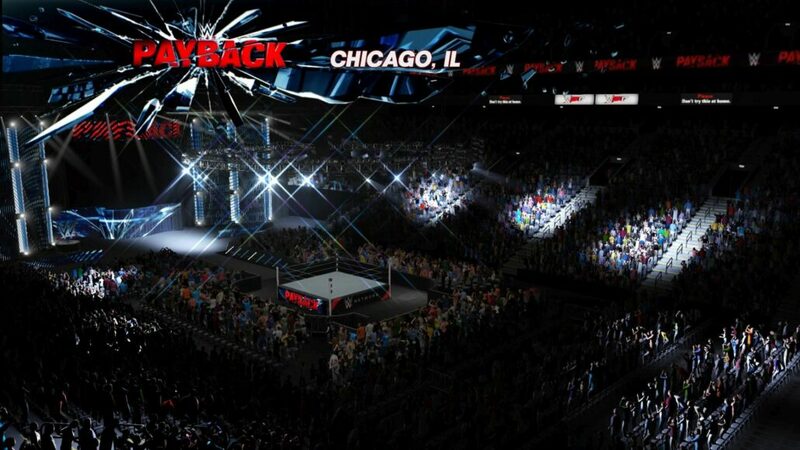 More moves are available, particularly when you include moves that are linked to the more interactable areas of the ring and arena. As good as this is, with the level of depth on offer, it suffers from the same problems as my Career. It’s insufferably slow, having to wait through ages of loading, even if only to change a few moves. What the created wrestler does allow for is a story of your own, provided you can put up with the problems I’ve previously mentioned. Moving up from developmental, skipping NXT for some reason, and right to the main roster. You’ll progress, take part in five-star matches and even gain in-game currency from merchandise sales to spend on new moves, characters and more. The promos all play a part in this as you attempt to make your character an extension of yourself. It’s strange then that with the actual choice of game modes being a mixed bag, the actual wrestling is now the best it’s ever been. The free-for-all chaotic action you could find in the PS2 and early PS3 games is still missing, but there’s a sense of gravitas to what’s on offer now. Chops reverberate around the arena, slams shake the ring and the really big knocks will send the stars rolling out of the ring in a desperate attempt to give them time to recover. The rollout, combined with the enhanced selection mechanics, make multiple wrestler matches considerably more entertaining. One wrestler takes a huge slam, rolls out of the ring and it allows for the rest of the wrestlers to carry on with the fight. You suddenly get a much more fluid match. Triple threat matches, fatal four ways and others are a lot closer to their real life counterparts thanks to this. That last minute intervention to stop your opponent from winning, but you’ve jumped in a little too early so you’re still only at half strength. These are the moments that make wrestling. In addition to this, there’s the greatly improved mechanics with the use of weapons and your surroundings. Tables and ladders can be put into position much easier, wedged into a corner, used as bridges and more. The inclusion of the fight sprawling out into the fans (albeit very limited to one area only) and backstage brawls also means that no disqualification and falls count anywhere matches actually mean more. New weapons and new areas to interact with means you’ll have that bit more fun with your fights. I can’t help but be disappointed in WWE 2K17. Aesthetically it’s the best looking game of the series, though it’s well known that some of the superstars are pathetically rendered, while others look nothing short of fantastic. What this indicates best is the pecking order of the superstars. The crowd rendering isn’t exactly fantastic, though the stadiums are designed a little better. Overall it’s still more than passable, though the disparities are a little too noticeable. The real problems come with the previously mentioned loading times. These are loading times you come to expect from considerably older games on massively inferior tech. It shows a distinct lack of care by the developers and that’s much more damning than any DLC practices. It also counters any attempt to improve the game through more areas, weapons, moves and whatever else has been included. When a game like Final Fantasy XV has the ability to show as much as it does, or Football Manager can process as much data as it handles, all without the loading times found in this game, it shows there’s something wrong behind the scenes. This is where WWE 2K18 desperately needs to improve. 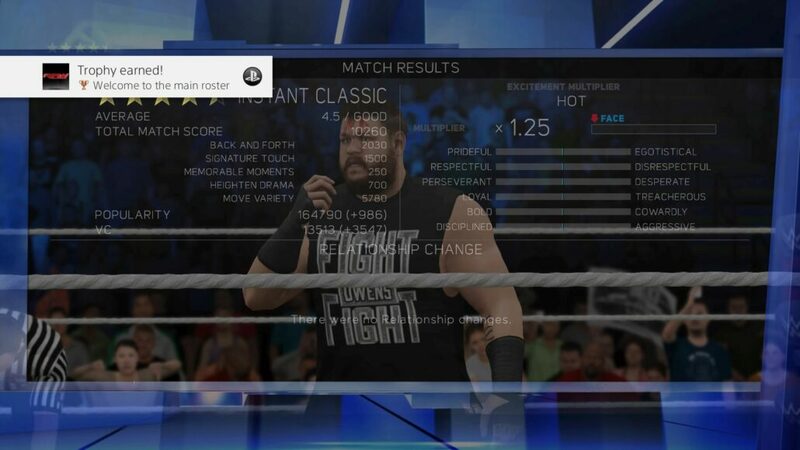 That, and now the show has split brands, the game can take the monumental opportunity that offers to bring back the old Smackdown vs Raw contests. For WWE 2K17, well it’s mediocre at best. It’s lost some content, improved on the rest but marred by the fact that the game is nigh on unplayable. If you want to play it, make sure you’ve got your phone with a game on to pass the loading times. WWE 2K17 is superior in a few ways to its predecessor, with a much improved wrestling system. At the same time, loading times are worse and there's a lack of Showcase leaves a gap the MyCareer and Universe modes simply can't fill. Aesthetically lacking and, frankly, boring too much of the time, it's hard to recommend this. Particularly when considering the prohibitive DLC practices that keep active members of the roster behind a pay wall.